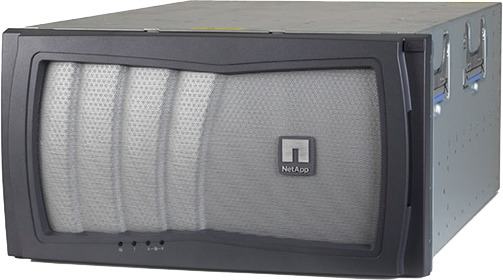 NetApp FAS2200 offers powerful, affordable, flexible data storage for midsized businesses and distributed enterprises. More powerful unified data storage systems start below $8,000. Integration with Windows and VMware simplifies management. Virtual Storage Tiering accelerates application performance. Automatic data movement between SSD and HDD increases storage efficiency. The cluster-ready systems can scale to 432TB. Midsized businesses and enterprises with distributed environments need powerful, flexible data storage to handle data growth. The NetApp FAS2200 series, named a ‘Champion’ and ‘Best in Overall Value’ by Info-Tech Research Group, is affordable, and is a more powerful storage platform than other systems in its class. Start right with unified storage for SAN and NAS. Accelerate application performance and optimize storage costs with NetApp Flash Accel Server Cache and Flash Pool Intelligent Caching. Keep it simple with intuitive storage management tools that integrate with key business applications and virtualisation environments. Grow smart while protecting your storage investment, with cluster-ready upgrades using the same NetApp operating system and software tools. 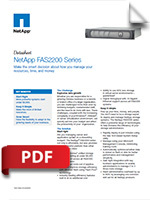 NetApp software on FAS2200 systems reduces disk purchases by 50% or more and cuts provisioning time by up to 90%. The NetApp FAS2200 series delivers no-compromise unified storage, with industry-leading efficiency features at no additional cost, to boost performance and handle storage growth. FAS2200 systems come with the NetApp Data ONTAP operating system and advanced data management and data protection tools. NetApp FAS2200 systems include a standard set of software products that deliver storage efficiency, simple data management, and high performance. Optional extended-value software products provide advanced capabilities, including instant data recovery, instant cloning, data replication, disk-to-disk backup, and application-aware backup and recovery. * Based on optional dual-port 10GbE or 8Gb FC mezzanine card and single slot per controller.